A man with severe health problems who was declared fit for work is set to receive all of the benefits he was originally denied thanks to a regional daily. The Liverpool Echo splashed on Monday on the case of Stephen Smith, showing an image of the 64-year-old in hospital over Christmas after his weight dropped to six stone and left him fearing for his life. Mr Smith was forced to get a pass out from hospital to go and fight a decision by the Department for Work and Pensions, which repeatedly denied him Employment Support Allowance – and insisted he was fit and capable of finding work. However, the DWP has now agreed to provide him with back payments for the money he was denied after the Echo highlighted the case. A DWP spokesman said: “We are sorry for the experience Mr Smith has had and we are committed to ensuring that people with health conditions get the support they’re entitled to. 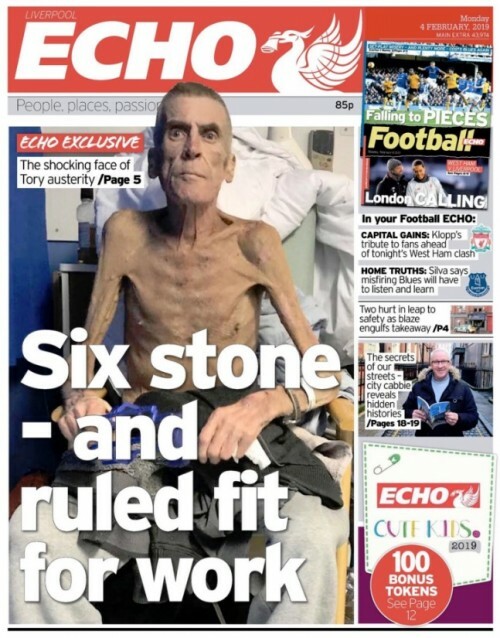 In an opinion piece accompanying the Echo’s initial story, political editor Liam Thorp wrote: “As a journalist in Liverpool in recent years I have come across countless stories of ordinary people being treated appallingly by the current government. “You learn to develop a thick skin for the many terrible tales of vulnerable people being denied the vital support they need and forced further towards a painful world of poverty – you have to in order to do the job at hand. “But when I first laid my eyes on the pictures of 64-year-old Stephen Smith, emaciated, desperate and close to death – I was genuinely taken aback. Liam told HTFP: “Obviously we are all really pleased Stephen has now got the vital money he needs and should have had access to years ago – but it should never have come to this. “When I sat down with him it was painfully obvious how unwell he is and has been – how he was ever deemed fit for work is beyond me. “I think this type of story does show the powerful campaigning role that local and regional journalism still has for communities who otherwise might not feel that they have a voice. This was a superb bit of reporting this, credit to the excellent Liam Thorpe and team. Yup, disgraceful treatment. There are shirkers and the genuine sick, it surely doesn’t take a genius to work out which this guy is. Well done Echo.